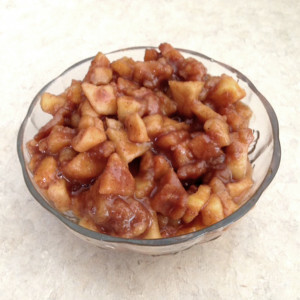 I mentioned in a recent post that I was spending hours cutting up apples a neighbor gave us for applesauce and apple pie filling to put in our freezer. 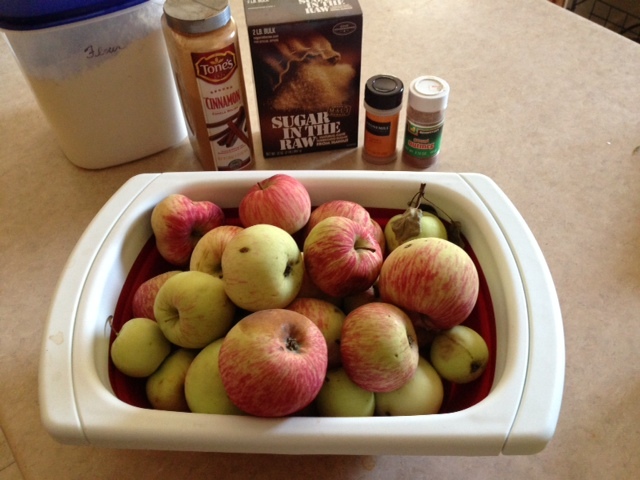 Here's a quick recap in case you are looking at two or three bags of apples and don't know what to do with them. First I cut up a bunch into cubes with skins on and threw them into sandwich baggies for the freezer. Rather than using lemon juice to keep them from browning, I soaked them in salt water as I cut them up instead. I had read on Pinterest that someone had tried it and it worked so I tried it - besides, it was cheaper and easier. They've been in my freezer a week now and are as white as the moment I cut them up. Yay! After that I spent a couple of days making applesauce. I sliced and peeled them and threw them into my 7 qt. crockpot with some water, turbinado sugar, and cinnamon for 4 hours on LOW. I then used my submersable blender and blended it up, leaving it chunky. I froze it in Rubbermaid containers. Today I peeled and sliced apples for apple pie filling - only I won't be making apple pies. I will be using them for icecream, cake, pancake, waffle, and cupcake toppings. Here is my 7 qt. 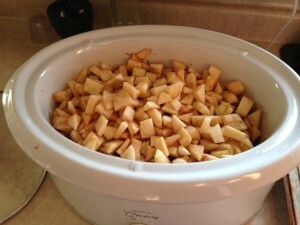 crockpot full of the apples after I'd sliced and diced. Now why did I do this? Oh boy, by the time I was done I needed a hot tub and a massage! Of course my husband came home just as I sat down - never do they return while we are working! Sometimes I think he waits outside until he sees me go sit down and then comes in. Here are all my apples cut up. I didn't care if they were brown, so I didn't bother tossing them in lemon juice or salt water. There are about 7 lbs. of apples. 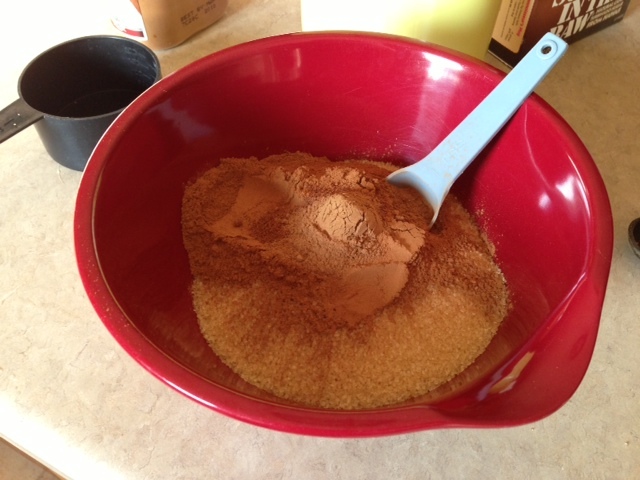 I got the pumpkin spice a year ago at Aldis just for fun, figuring I would eventually use it. It's not necessary, so don't worry about it if you can't find it. Though it does smell divine! 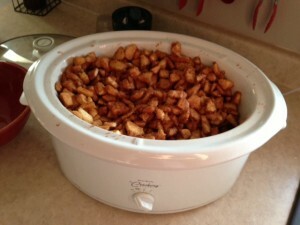 I threw it all into the crockpot and mixed it up with the apples and set the crockpot on LOW for 4 hours. I stirred it off and on to make sure it was evenly distributed while it cooked. Of course you need to sample the apples once they're mixed it up with the sugar - just to make sure. At least that's the excuse I give when I'm sampling the goods! Just take a look at the yumminess! 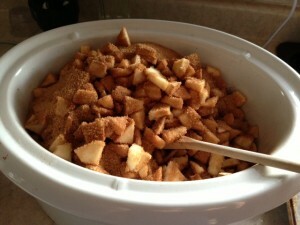 I served the DIY apple pie filling last night at my mom's birthday party for ice cream topping. It was a hit along with the strawberries I froze last summer. One of our fellow partiers, Dean, had several helpings of it. Though we were all teasing him about his constant return to our ice cream and cake buffet, I eventually told him that the sincerest compliment to a hostess is to see their guests return to the buffet table more than once. 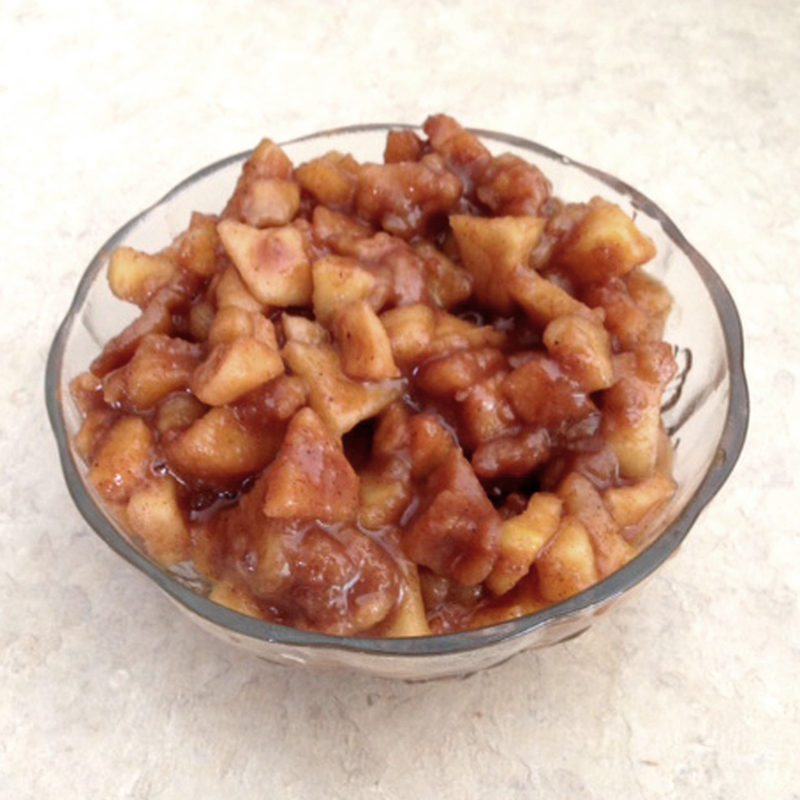 Not only is the quality of homemade apple pie filling healthier than what you find in the store, it always tastes better because you made it yourself. Any time you enjoy the fruit of your labor, it's sweeter than if you just grabbed a can opener, threw it in a bowl, and shoved it in the microwave. 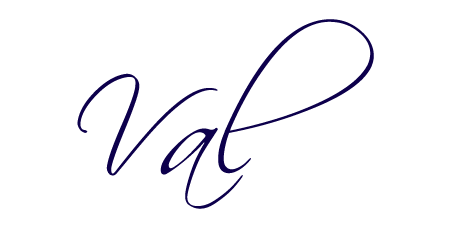 The best part, the thing that motivated me to do it in the first place was the savings. Free is good. Next, I made homemade fruit roll ups, or commonly called "fruit leather." Click here for how to make fruit leather, it's part of my crisis preparedness series. Fruit leather was one of my kids' favorites as is now my grandkids'. DIY Dried Herbs – Improving Our Lives Through Gardening Homemade Chalky Paint Recipes Direct Composting – Improving Garden Soil Keep Your Lettuce Sweet – It’s all in the timing Survival in a Crisis: DIY Pantry Preparedness – Using Food Dehydrators Canning Tomatoes for the First Time – DIY Fun! Did not think about fixing apples to be frozen. Will have to do that. We have been dehydrating them (husband has done 9 half gallon jars), making canned apple sauce and making apple cider with our Omega juicer. Our four apple trees(all organic as we don't spray) were loaded this year and decided that this year we would do as much as we could with them and then let the deer have the rest. Thanks Val for the good info! @Mary-Margaret, I was quite surprised when the apples stayed white even after freezing. I haven’t thawed them and used them yet, but I hope they retain their flavor as well as their color. Well see!